Some people have been asking what my convention schedule is like this summer. I’m still waiting for confirmation from a couple of cons but I can tell you for sure I’ll be at CONBRAVO in Hamilton Ontario July 26th -28th. I’ll be on a panel too talking about webcomics and such! Come check it out, it’s a great con! Yeah I guess the texture is the same. DX That looks like it would bloody hurt. Eventually you will have to share your toys with your kids. PFFFTTT! They can get their own. Legos are cool Arg. but seriously, I use construction site tape I got from the dollar store to mark of my lego space….. I have a corner of the room dedicated, but there’s always that one errant block that gets away. Thank you. I finally know what name my only phobia have. Now, excuse me, I have to scratch my whole body to bleed. He can make his own shoes! Lego compatible feet? What an awesome idea, endless fun to be had there! legless lego legolas legs on your legs. Not as bad as the odd marble. Lego peg shaped calluses! Do want! Also,love lins expressioj in the second panel, she looks a bit like a pouty monkey…in a good way. Her real pout is deadly and any representation of it, real or created is considered an act of violence. Why does nothing hurt like legos?! Even broken glass feels better. Lego is a special kind of hurt. A hurt that only the creativity lego can inflict. I used to have Lego end up everywhere, even in the yard. I blame the Scandinavians – only them Danes who created Lego and the Swedes who founded IKEA, would come up with stuff that would drive us crazy with frustration and angst – yet we can’t stop buying it. 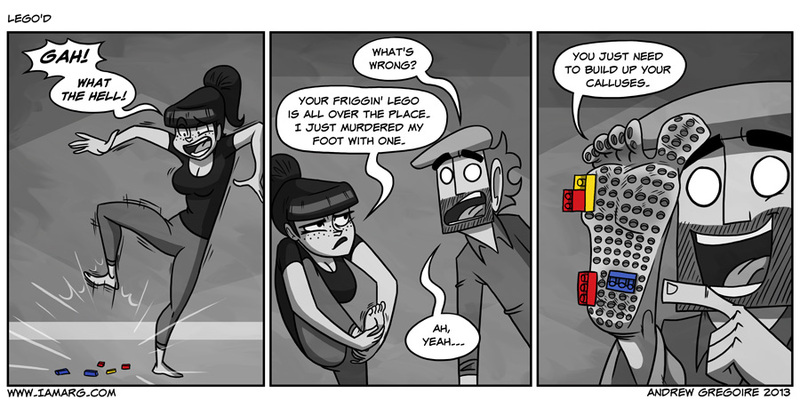 LEGOs being stepped on hurts the feet and possibly other body parts if those pieces are the small breakable variety. Lucy furs imps has a variation on the theme that is oh so much more painful. It’s just environmental conditioning really. If my kids have it then we can start looking into the lego foot gene. Oh God, I just had a ‘lotus breast’ flashback. From the looks of panel 2, Lynn’s very flexible…. That’s hilarious and legitimately disgusting.